Iran's Caspian Flagship "Seriously Damaged"
The Damavand is Iran's most powerful ship on the Caspian, and has been at the center of Iran's growing naval diplomacy on the sea. 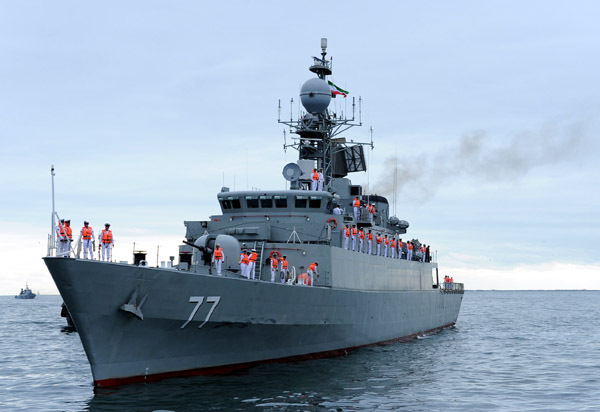 The flagship of Iran's Caspian naval fleet has been seriously damaged, and two sailors gone missing, in an accident caused by a storm, Iranian military authorities reported. The accident happened on January 10, when severe winds pushed the Damavand frigate into a jetty while it was in its home port of Bandar Anzali. Initial reports said the damage to the ship was “minor,” but on January 17 an Iranian military spokesman acknowledged that “the assessment teams have found out that the vessel has suffered serious damages and needs a complete overhaul,” said the spokesman, General Shahin Taqikhani, the Tasnim news agency reported. Tasnim and other media published photos of the ship listing substantially. Gilnegah, a local news website, reported that the storm caused waves up to four meters high. General Taqikhani also said that a search operation is underway to find two crew members who went missing after the accident and have still not been found. Gilnegah reported that six sailors were thrown overboard from the accident, but four of them were rescued. The Damavand was launched in 2015, and is the largest and most capable ship in Iran's gradually growing Caspian fleet. It measures 95 meters and 1,500 tons. But it also has been at the center of Iran's growing naval diplomacy around the Caspian, as it led Iran's first-ever flotilla to visit Azerbaijan in 2016, and also made the first-ever Iranian naval visit to Kazakhstan last year.